Artist rendering of the Beresheet lunar lander. Credit: SpaceIL. 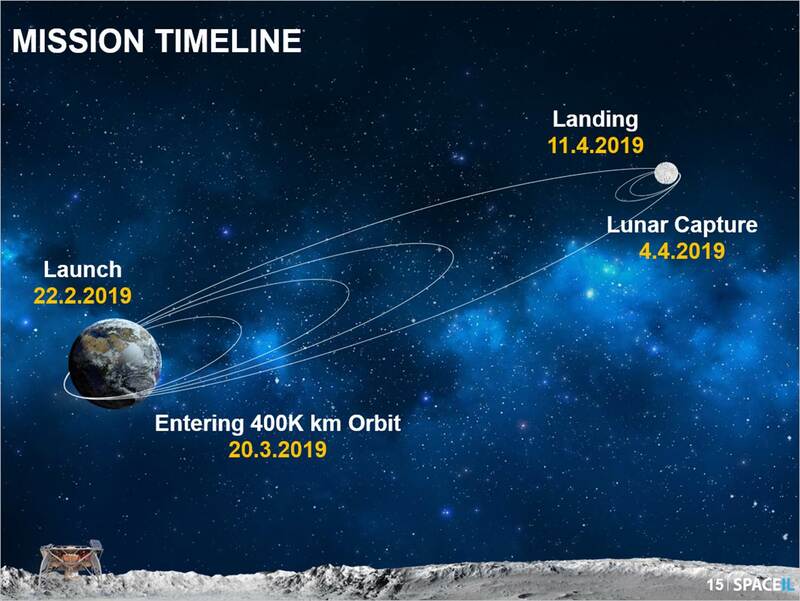 If all goes well with the launch and trip to the moon, then on April 11, Israel will make history and become the fourth nation to soft land on the Moon. The other three are the former Soviet Union, the U.S. and most recently, China. 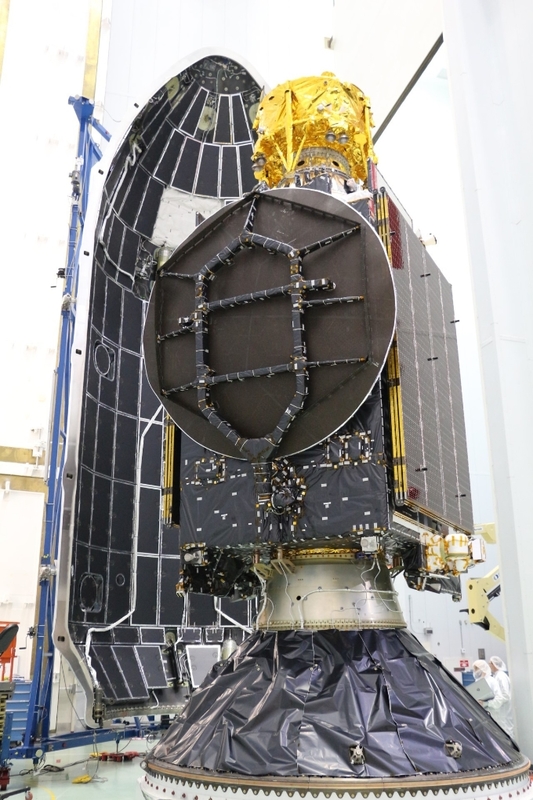 The SpaceIL Beresheet spacecraft stacked above the PSN VI satellite. Credit: Pasifik Satelit Nusantara (PSN). What makes the Israeli mission, called SpaceIL, so compelling, is that it’s not a big budget government project. In fact, the mission, run by a non-profit organization, was started by three young engineers, Yariv Bash, Kfir Damari and Yonatan Winetraub, as an entrant in the former Google Lunar XPRIZE in 2011. The projected mission cost is US$36M. By 2014 they had crowdfunded US$284K. Also in 2014, SpaceIL received US$22.4M in grants from three foundations. One of the rules of the Google Lunar XPRIZE was that governments and industry could not contribute more than 10% of its total mission cost and including the value of in-kind support. The Google Lunar XPRIZE came to end in March of 2018 with no winners. Regardless of that outcome, many competitors moved forward including SpaceIL who were able to raise the rest of the funds needed to complete the mission. SpaceIL mission timeline. Credit: SpaceIL. In 2015 Israel hosted the International Astronautical Congress, an important annual international conference. It was clear that Israel was announcing to the world, we’re open for business, our technology is good, partner and invest with us. Prominently on display was the SpaceIL lander. Senior industry leaders made themselves available and praised the efforts of the SpaceIL team among other projects and products. SpaceIL’s spacecraft will land on a site within Mare Serenitatis, on the northern hemisphere of the Moon. Credit: SpaceIL. Based on the people I spoke to in Israel, they are succeeding. This mission has captivated the country. The level of interest and student involvement is tremendous. According to SpaceIL, the Beresheet spacecraft will land within Mare Serenitatis in the northern hemisphere of the moon. 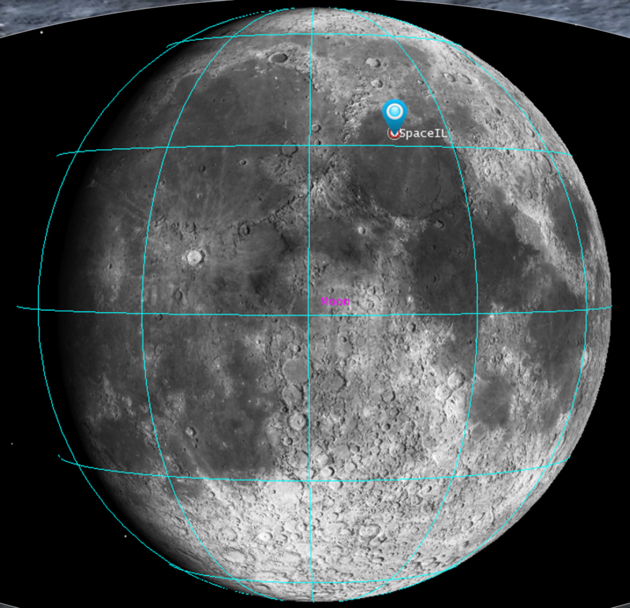 The primary scientific experiment, which includes a collaboration between the Weizmann Institute of Science and UCLA, is a magnetometer that is designed to take measurements of the moon’ magnetic field which include anomalies in the landing site area. The spacecraft was also designed to “hop” from its landing site to another location 500 meters away. That was one of the criteria for winning the Google Lunar XPRIZE. The Beresheet will at some point make an attempt to hop to another location. NASA is also involved in the mission having signed an agreement with SpaceIL to provide communications support and observe the spacecraft from orbit. For Israel, the long-term benefits of this mission in inspiring the next-generation of innovators is invaluable, even if the landing fails. Only “superpowers” have soft landed on the moon. At some point a small to mid-size space nation was going to land on the moon. That Israel is that country, is disappointing to some extent if you’re in the Canadian space community. While everyone in Canada will hope Israel succeeds, you have to wonder why isn’t this Canada’s mission? Why aren’t we on the world stage? After all, we are always proud to say and point out we were the third nation to ever build its own satellite (Alouette) and have it flown. We always point to our robotics successes. The reason is simple. It’s not the space community’s fault. It’s our political leaders and some within the civil service who work with them, especially Deputy Ministers, who are timid, conservative, overly practical, and frankly, over the last 20 plus years, unwilling to take a risk when it comes to Canada’s space program. Canada needs to step up or get new leadership.